While on a “Glamorous” camping trip, having dinner with friends and colleagues or enjoying a nice meal at home, have you ever been uncomfortable opening a bottle of wine? Fear no more! 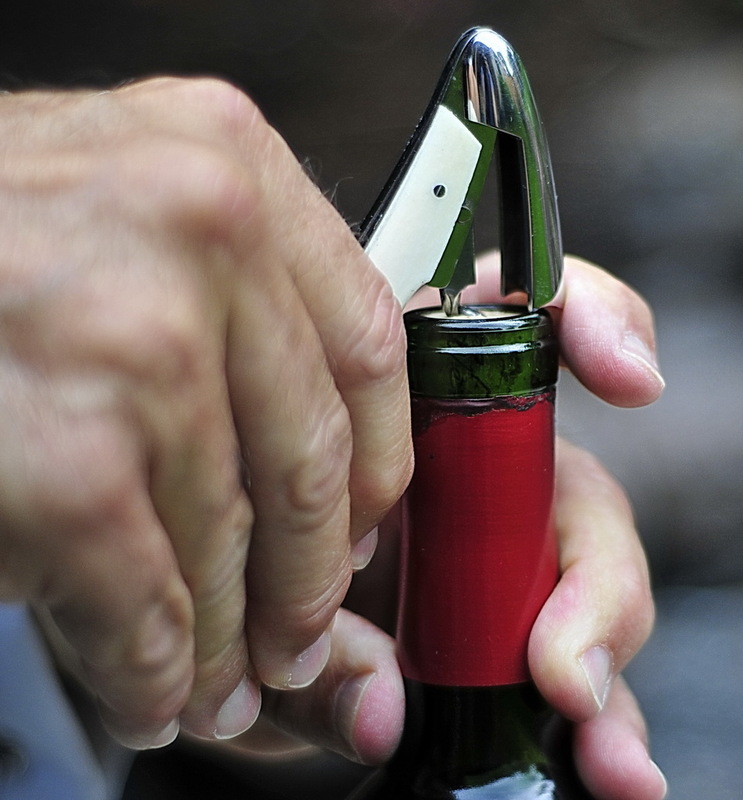 Hub’s is here to help with a simple and easy method of pulling a cork from a wine bottle. 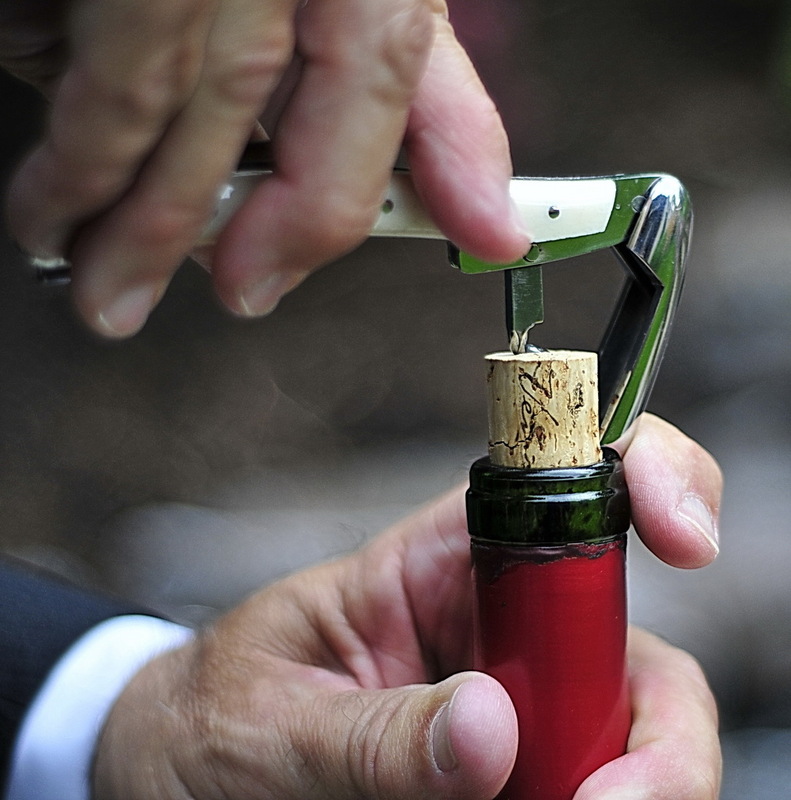 Extracting a cork from a bottle of wine is a relatively simple process, once a person is properly appraised and instructed. I realize that this subject causes many people a great deal of angst and frustration. Many consumers shy away from wine with cork closures because they are not comfortable or confident with getting the cork out of the bottle. Well – lay your fears to rest! After reviewing this outline and procedure (and with a little practice), you will approach the subject with self-confidence and self-assurance and you will sufficiently impress your friends and colleagues with your wine oriented knowledge and ability. Additionally, when you are comfortable with extracting a cork, you will open yourself to a wider array of quality wines. There are literally thousands of varieties of openers and a number of modern contraptions that have been invented to make the process easier and more convenient. But, from my prospective, I prefer the traditional “captain’s”, “sommelier” or “waiter”, wine key, corkscrew or wine opener (that covers most of the names for this type of opener). 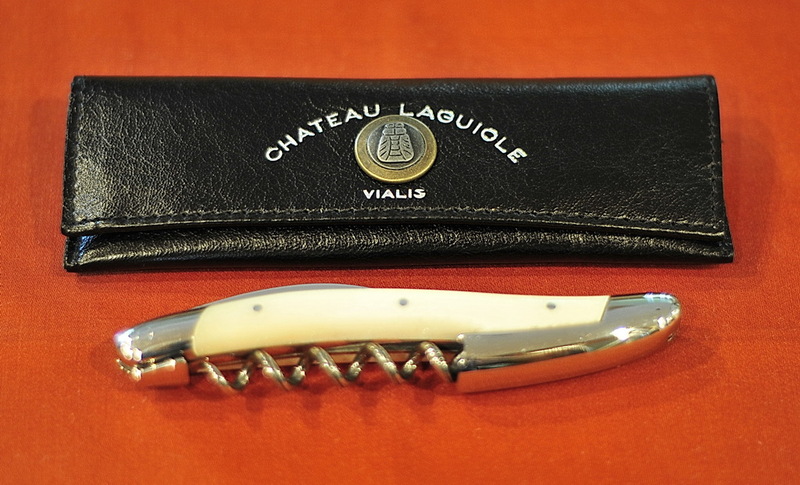 My all time favorite wine opening apparatus is made by Leguiole. I like this corkscrew based of the design, functionality and because of its very attractive appearance (Leguiole openers are works of art). 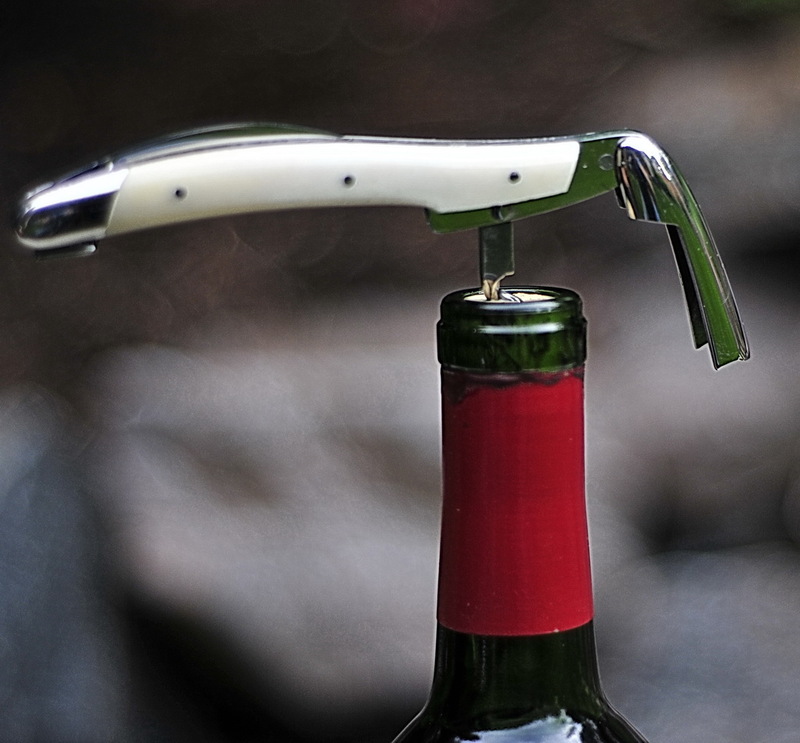 Also, I prefer a wine opener with a good-sized knife, not that useless little curved thing like on some units! 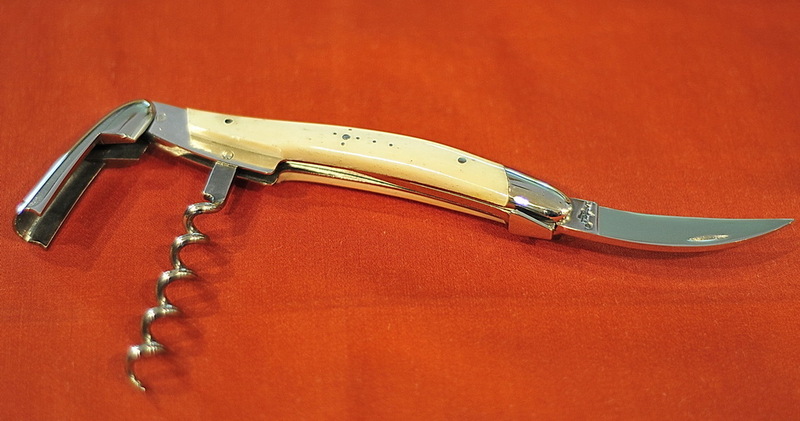 Although the Leguiole corkscrews are sleek, streamlined, beautiful and functional, they can be rather expensive. Anyone that is not comfortable with the cost of this type of opener can seek out a corkscrew with similar design features. The following steps outline a practical and less intimidating procedure for opening a bottle of wine. The entire process can be accomplished on a counter, top of a dining table or even on a picnic table at a scenic campground in the great outdoors. Please understand, this is not the recognized and official procedure of the Court of Master Sommeliers. For the professional, this process is done entirely on one’s person and is intended for presentations table side in a fine dining establishment. My procedure is more relaxed and convenient in nature. The ultimate intention here is to make everyone comfortable with getting the cork out and the bottle open with the least amount of stress and frustration. THE STEP BY STEP PROCESS. 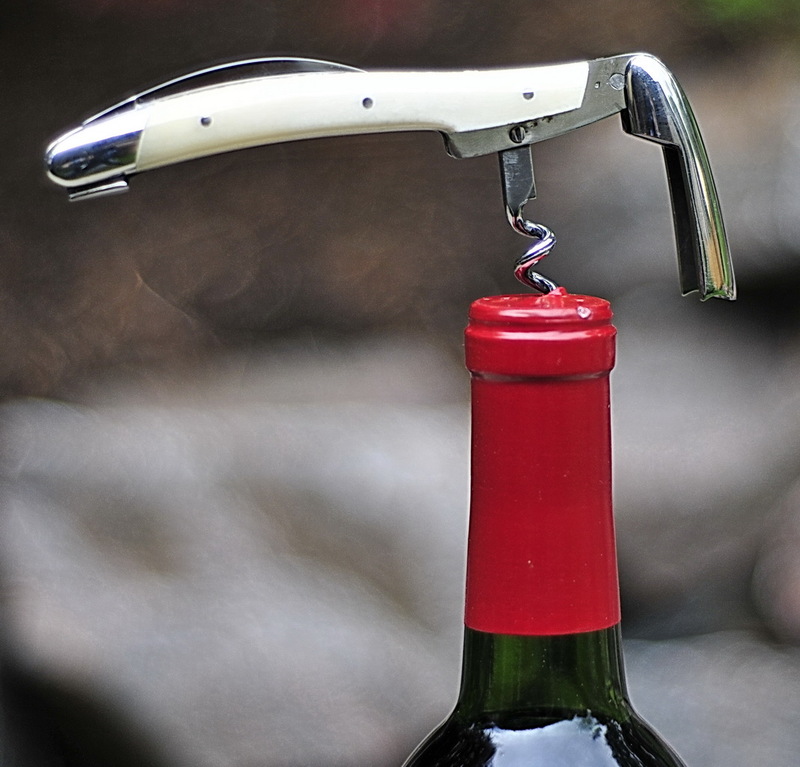 . .
Place the knife of the corkscrew against the bottom lip of the bottle, far enough away from the opening so, the foil will not come in contact with the wine while pouring because, it may taint the wine and contribute to a metallic taste. Position the knife at a slight angle, this will help roll the foil up on the edge and assist you with its removal. Cut completely around the circumference of the bottle making sure that the foil is adequately separated from the top portion of the capsule. With the edge of the knife, carefully remove the foil. Some capsules are made of a plastic material. With this type of closure the process is relatively the same. Never try to extract the cork without removing the capsule. Not removing the capsule before extracting the cork is not recommended ~ as seen below. It will make for an unsightly mess and has the capacity to alter the taste of the wine. Cut the foil carefully, being mindful not to tear the foil rendering the packaging unsightly ~ as seen below. Never completely remove the capsule ~ as seen below. Especially with older vintages, there can be a sticky, gunkey, moldy and unsightly residue under the capsule that has accumulated during storage. 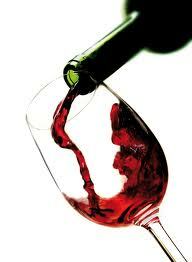 Do not fret, this is not a problem, it is quite normal and this does not mean that the wine has gone bad. 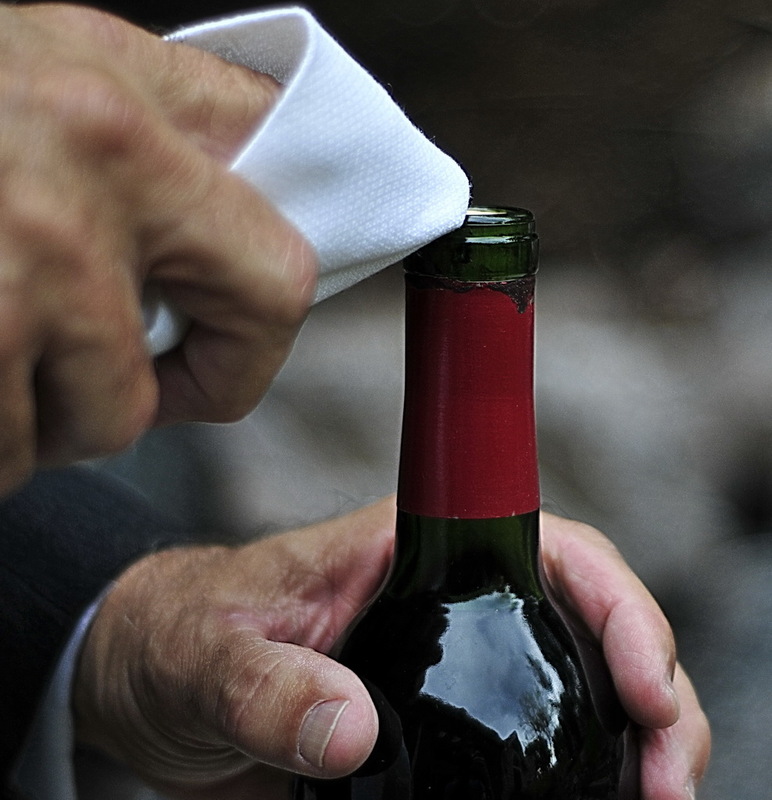 Just wipe clean the top of the cork and bottle with a lint free moist cloth. Wipe the top clean even if you don’t see any residue. Never use a paper napkin or a paper towel – that will be disastrous – with bits of torn paper defiantly clinging to the residue on the cork and bottle! Insert the tip of the “spiral worm” in the center of the cork at a slight angle.
. Insert the tip of the worm into the cork (about ¼ inch) – then, raise the corkscrew up to straight vertical position. While applying a gentle downward pressure, turn the worm (of the corkscrew, not the bottle) in a clockwise direction until the entire spiral worm coil is entirely embed into the cork. 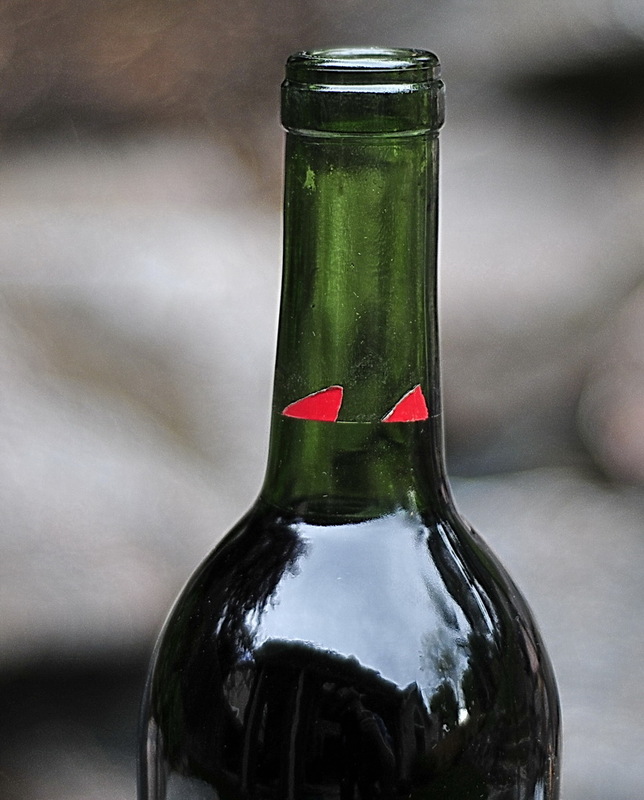 Be careful to keep the worm in the center of the cork, parallel to the inside rim of the neck of the bottle. 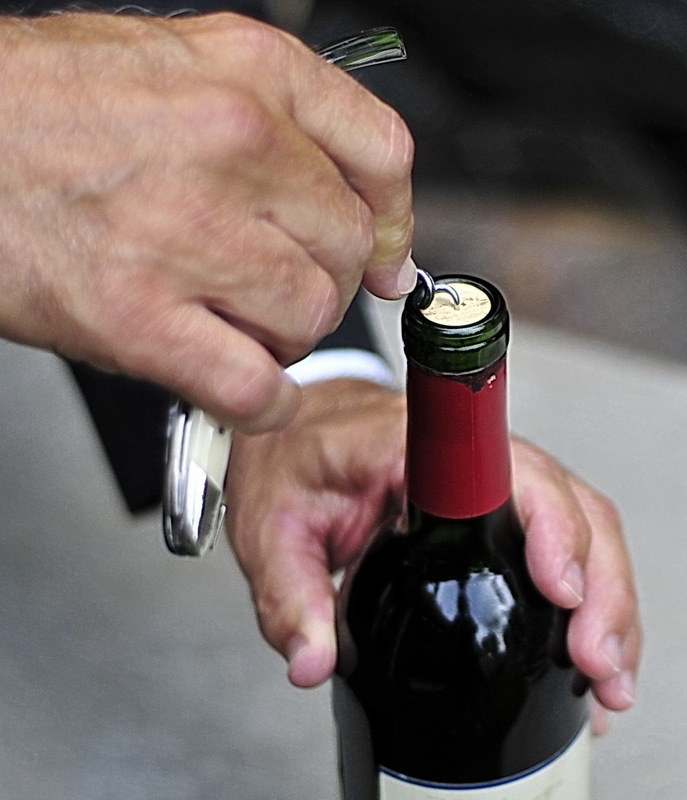 Place the lever of the opener on the lip of the bottle, hold the lever firmly in place with your index finger of the opposite hand – keep fingers outside the prying fulcrum of the opener (it can be very painful if your fingers are caught inside the apparatus while pulling up on the corkscrew). Begin pulling the lever of the opener in an upward and vertical fashion. 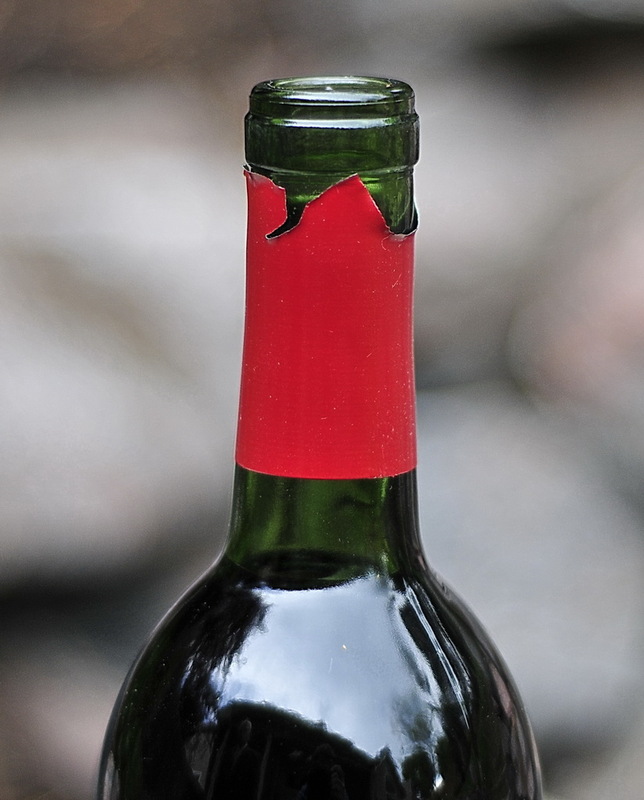 At a severe angle, the cork, bent and stressed, could split apart. This can also happen when the spiral worm is not sufficiently embedded into the cork. Completely remove the cork from the bottle. With a moist lint free cloth wipe clean the top of the bottle and around the opening, being very careful not to push any debris into the wine. Following this final step you are ready to pour some wine and enjoy the fruits of your labors! 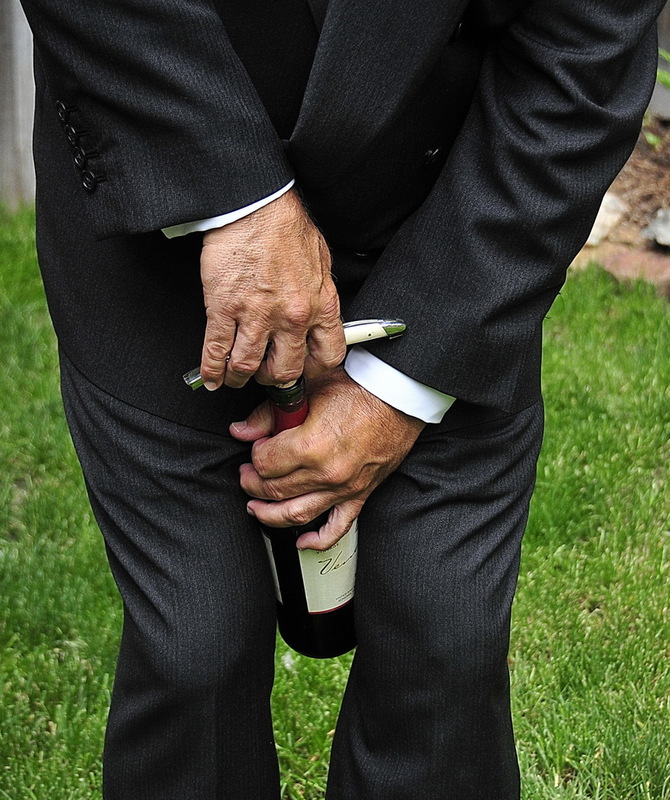 Although, I have personally witnessed this rather peculiar and somewhat obscene method of extracting a cork in a number of cafes and bistros along the famous and exceedingly prestigious Champs-Elysees in Paris; I do not approve or support this strange practice of putting the bottle of wine between the legs and yanking out the cork! What were the waiters in Paris thinking? 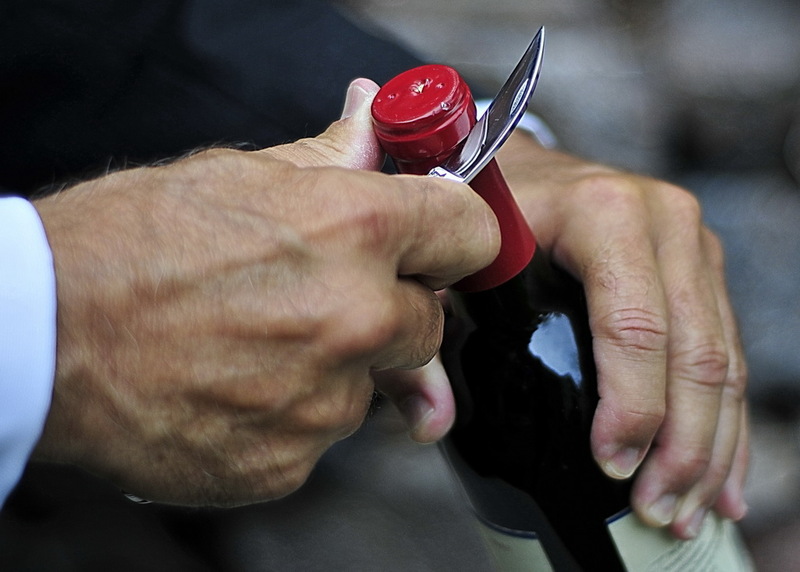 There are many observations and considerations during the bottle opening process that have to do with the evaluation and appreciation of the wine. I plan on covering this subject in a future blog contribution. I trust that with a little practice you will ultimately be less intimidated and more comfortable with the process of opening a bottle of wine. Also, I hope that in the future, you won’t relegate yourself to screw caps and bag-in-the-box wines only. I don’t say that condescendingly! 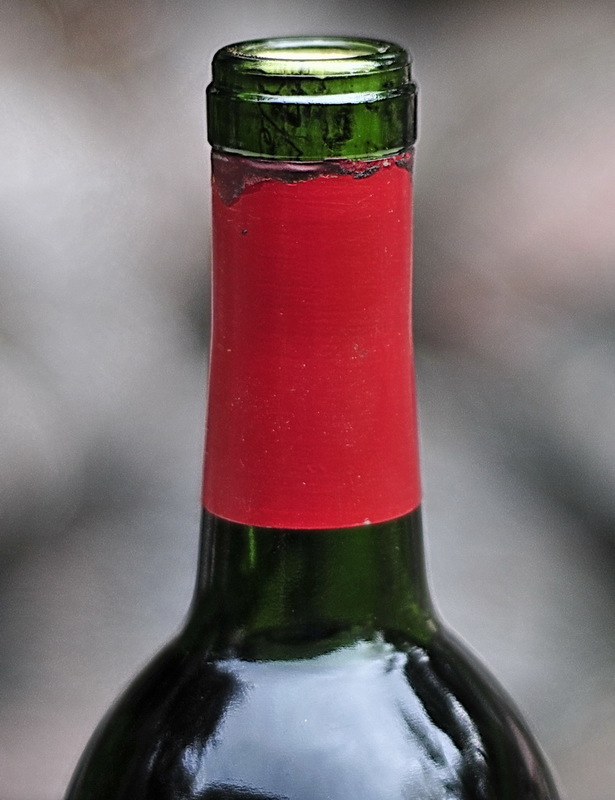 There are many respectable wines that are being released with “Stelvin” closures (nice name for screw caps) and being sold as boxed wines. But hopefully, with the knowledge of how to “pull a cork” you will feel less anxiety or apprehension regarding wines with cork closures. Confident and competent, you will be comfortable enough to “widen your horizons” and consider a greater range of wines that are available with corks. Thank you for the opportunity to share this learning with everyone. Another excellent post, Paul! Keep ’em coming! Wow I have committed every wine foul there is!!! Now I can open a bottle of wine in public instead of disappearing around the corner to put it between my legs…and I am so glad I did not buy stemless glasses a few months ago. Keep the hints coming! !